Like that one special dream girl referred to simply and endearingly by pronoun, Her has all the makings of the perfect package: It’s fun but mature, light but poignant, playful yet moving, lonely yet hopeful. 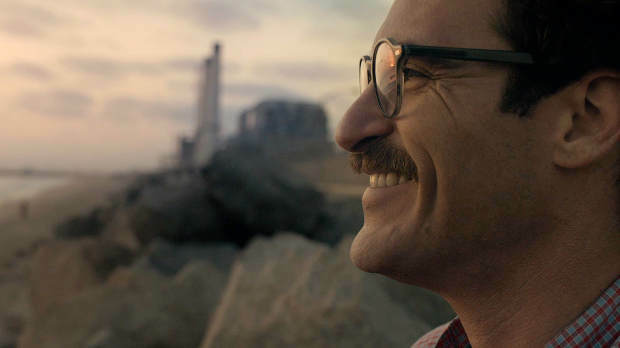 In his limited, but exceptionally creative and distinctive repertoire of films, Spike Jonze has always displayed a knack for story-telling with a very conscious focus on character development. Aided in large part by fantastically written scripts by frequent collaborator Charlie Kaufman (Being John Malkovich, Adaptation), Jonze has amusingly explored the theme of human connections in a rapidly changing world seen through the lives of some very memorable and eccentric characters. Her is a natural and beautiful extension of his existing experience, this time (and the first time) penned entirely by himself, and splendidly successful in capturing the complexities of modern love. Often one to opt for high-concepts as part of his narrative vehicles, Jonze again incorporates a bit of a science fiction element, but never loses sight of the human element at the heart of the story. And this story has got a whole lot of heart. Set in the very near future, Theodore Twombly, played wonderfully by the always-captivating Joaquin Phoenix, writes the most beautiful handwritten letters for any and every special occasion imaginable–only he writes them on behalf of other people for their loved ones to earn his livelihood. In his real life, Theodore is a lonely man looking to , make a special connection with someone while trying to come to terms with a painful divorce from his ex-wife, Catherine (Rooney Mara). Picking up on one of the latest tech trends, Theodore buys himself a new operating system (OS) with artificial intelligence that customizes itself to his personality. The OS, voiced by Scarlett Johansson, names itself Samantha and tends to Theodore’s needs, progressively becoming more perceptive of his quirks, and in turn, evolving into something so closely human. Theodore and Samantha become fast friends and before too long their relationship escalates to the point of a seemingly perfect, yet socially unconventional and confusing romance. At the spine of this marvelously-executed charmer is a fantastic script that manages to puts words to intricate feelings and emotions that even the most sensitive sorts might have difficulty articulating. These tangible words for intangible feelings transcend their meanings once they’re uttered by the very real and likeable characters driving the plot onward. 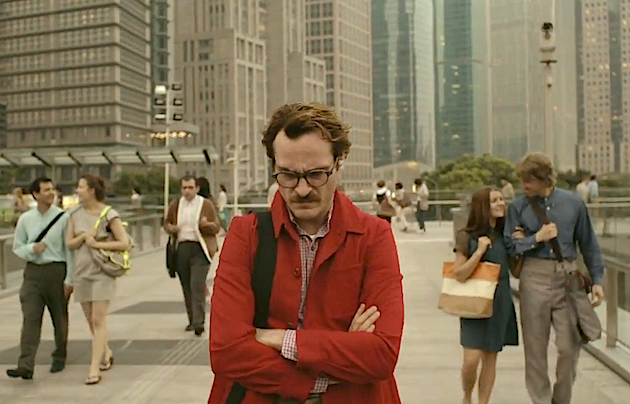 Joaquin Phoenix is, of course, phenomenal in his portrayal of a reserved man heartbroken by a painful split from his wife, who learns that he still has the capacity to live with joy. Foregoing the typically mopey loner trope, Theodore is a layered character with a full range of emotions, which are often deeply seen and felt rather than explained. Scarlett Johansson in voice form so perfectly compliments Phoenix in his every nuanced expression, emotion, and thought that it’s almost a mind-trick to virtually insert her into the film. Perhaps the most remarkable feat of all is the construction of such organic, endearing chemistry between two characters who never physically interact or even appear in any scenes together. We’re supposed to constantly remember that Samantha isn’t even really human in spite of her uncannily evolving capacity for humanity, but the emotional attachment to her is stubbornly unshakeable. What they share together is so beautiful and realistic that their stark differences in existence and life experiences are foolishly, yet blissfully irrelevant. While the well-written script captures the poetic beauty of Jonze’s modern love story, the cinematography, production design, and costumes paint the physical picture as a mirror image of the screenplay. The soft colors and textures of the environments establish a sense of comfort, while selective pops of one or two other bright colors provide a contrasting sense of wonder and intrigue. The city of Los Angeles photographed by Hoyte Van Hoytema is still a little lonely in this universe, but more so lightly melancholy than glumly daunting, with the softened look of the metal skyscrapers and concrete pavements. Production designer K.K. Barrrett‘s envisioning of the old-fashioned-looking costumes (most notably, high-waisted pants) draws in a sense of familiarity and longing for simpler times as a juxtaposition to the supposedly progressive society the characters operate in. The cherry on top of it all is the luminous score worked on by indie poster-child band Arcade Fire. The tranquil instrumental melodies fill in the gaps where there are no words, or none are needed, and compliment the rush of new and changing emotions felt by Theodore and Samantha. Next articleAFI Festival Wrap Up 2013: Favorites of the Staff!